Among the little principalities, one in particular gained a special reputation for its warlike character: Hessen-Kassel, whose people were descended from the ancient warrior Catti. Of all the princes who let out troops for hire, those of Hessen-Kassel were the most successful, and eventually incurred the greatest odium. Hessen had become Calvinist in 1605, and fought consistently on the Protestant side in the Thirty Years War. Armies were ceaselessly marching across the land or quartered in its town. The longer the struggle lasted, the more of the people were under arms. And when the Hessian troops were finally disbanded at the war's end, the White Regiment of General Geyso and some other bodies of men were kept on as three Schlosscompagnies to guard the Landgraf's palace. 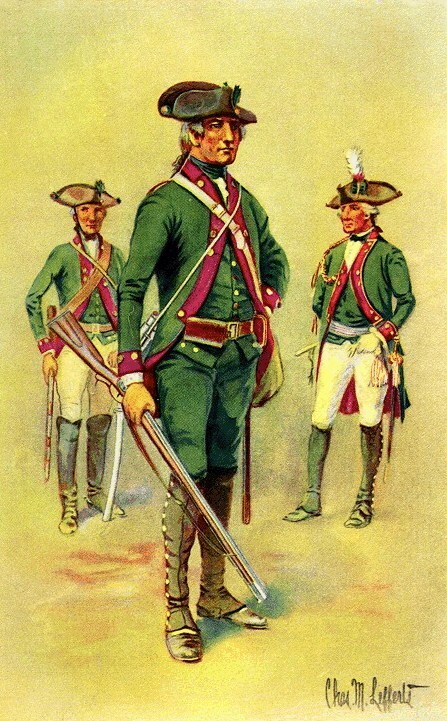 These units were to form the nucleus of the Hessian Guards, the core of the Hessian army. Hessen had received subsidies for fighting in the war, and the countryside, which was generally poor, had been wasted. Thus it was not illogical to look on the army as a source of income. In Germany there was a centuries old tradition that troops had to pay for their own upkeep. To take this course was the decision of the Landgraf Karl (1670-1730). The European power struggle in the century following 1660 facilitated the soldier business, for the great powers, without modern resources to conscript and maintain armies, turned to princes like Karl, who had a steadily growing force. By 1676 the original three companies had grown to eighteen of foot and five of horse. Karl, however, did not initiate the new phase in the soldier business; namely, the leasing of standing troops by a prince himself at peace to another state at war. This was done by Duke Johann Friedrich of Braunschweig, hiring three regiments to the Republic of Venice in the 1660s. Karl of Hessen concluded the first agreement of the Hessian soldier trade with Christian V of Denmark in 1677. Hessen sent ten 'compagnies' of sixteen men each at twenty talers a man. The 3,200 talers thus paid were used by Karl to equip his troops, for from the very beginning the country's revenues were insufficient to support the army alone. In that same year Hessen profited from the war in another way: Brandenburgers and Danes paid to be quartered there during the winter. In 1687 Hessen-Kassel and Hessen-Darmstadt sent troops in the service of Venice to seize Morea from the Turks. The Regiment Prinz Karl was specially formed in Hersfeld in April 1687 of 1,000 men drawn from recruits and from other units, for each of whom Venice paid fifty talers. This expedition was even more costly than the Danish one. Of the 1,000 only 191 returned; of 1,000 Darmstadters only 184. Yet Negroponte was taken and the terrible Turk thrown back. Under the military arrangements of the German Empire, Hessen was to contribute troops to the Upper Rhine Circle. Karl, however, began to develop his army as that of a self-contained state. To increase this army he continued to obtain revenues from subsidies, and although Hessen was landlocked her best customers were maritime powers, the Venetians, Holland and England. In 1688 by the Concert of Magdeburg some 3,400 Hessians took service under William of Orange, freeing Dutch troops for the expedition to England. Karl's troops distinguished themselves in the Wars of the Grand Alliance (1688—97) and Spanish Succession (1701—14) against Louis XIV. Although hiring soldiers was profitable to the Hessian ruling house, the princes shared the perils of war with their subjects. Five of Karl's sons were in the field, and two of them fell in battle: Karl at Liege in 1702 and Ludwig at Ramillies in 1706. A corps of 10,000 Hessians crossed the Alps and served with Prince Eugene in 1706-7 and thereafter in the Netherlands. Despite various bribes offered by the French, Karl remained loyal to the allied powers. This was not solely for financial reasons. One notable consistency of the Landgrafs' policy was to hire their troops exclusively to Protestant powers, for the Hessians remained stern Calvinists. After the treaty of Utrecht ended the wars of Louis XIV, Karl's son Friedrich, married to the sister of Charles XII of Sweden, led an auxiliary corps of 6,000 Hessians into Swedish service, but the intercession of Prussia and Britain prevented them reaching the battlefields of Pomerania. George I of England made a new agreement to secure the services of 12,000 Hessians to protect his throne against the Pretender. When Britain joined the Quadruple Alliance in 1726, she once again hired the soldiers of Hessen to fulfil her continental obligations. By a treaty of 1727 she paid an annual retainer of £125,000 to have first call on the Hessians' services. Britain was rapidly becoming the Landgrafs' best customer. For the first time the term Soldatenhandel was applied to the Hessian princes' dealings. By 1731 the Hessians had become such an established part of British foreign policy that Horatio, first Baron Walpole, dubbed them 'the Triarii of Great Britain, her last Resort in all Cases, both in Peace and War; both at Home and Abroad; howsoever ally'd, or wheresoever distress'd!' Objections to hiring the Hessians were not made against subsidy treaties in themselves; they were grounded on expediency: against the cost, against introducing foreigners into the kingdom, against sacrificing Britain's interests for those of the Despicable Electorate. Lord Strange was one amongst many who said it was contrary to the law of the Empire, for the Hessians might find themselves at war with their sovereign, the Emperor. He might as well have saved his breath. In 1731, a time when Britain was at peace, Sir Robert Walpole obtained a vote of £241,259 1s 3d for keeping 12,094 Hessians in readiness for British service. Nor was the Emperor likely to condemn the commerce in soldiers. He was a customer, and most of his theoretical subjects were in the market like Hessen. It was scarcely surprising that the learned professors of Wiirttemberg, Rostock, and Helmstedt all proved conclusively in their theses that the princes had the legal right to aid foreign powers and that German fighting men were permitted by the law of the Empire to go into their service. In actual practice all British ministries resorted in wartime to employing mercenaries. 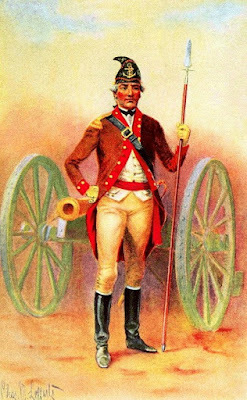 The arguments in favour of hiring the Hessians were that as trained troops they could be ready much more quickly than Britain could recruit and train men; that Hessen's geographic location put her close to any probable seat of war; and most compelling of all, but one never admitted, that Britain's own military establishment at the beginning of any war did not inspire confidence. The most eloquent example of Britain's eighteenth-century dependence upon continental mercenaries is Pitt, who condemned paying subsidies in violent speeches for years and voted against the treaties of 1755 with Russia and Hessen-Kassel. Yet during the Seven Years War he paid out subsidies not only to Frederick of Prussia, but also to maintain 'His Brittanic Majesty's Army in Germany', an army composed mainly of Hessians, Hannoverians, and Brunswickers; and at the end of the war he boasted that he had conquered America in Germany.